NEW YORK, May 18, 2012/ — Move over Carrie Bradshaw and Blair Waldorf. New York has gone to the dogs! While dogs go on therapy in CBS’ “Dogs in the City” (premiering May 30th), the fashion set is dressing them up with Legitimutt, a line of luxury products for dogs. 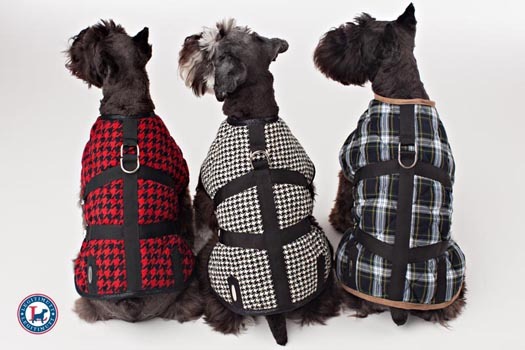 Unveiled last Wednesday at The DOG Store on the Upper East Side, LEGITIMUTT provides fashionable products for our favorite four legged friends. Created by supermodel Kristy Hinze Clark and her longtime manager, and friend, Neal Hamil, the duo was inspired by their beloved Schnauzers – Greta, Gracie, Ava, Brando and Elwood, when they created this luxurious and glamorous product line. “The love of and from my dog opened my heart as never before about the importance of the animal world. Quite unexpectedly I developed an almost irrational devotion to animals and their protection and humane treatment. It is my truest passion and my dog and all the dogs in my life and, in fact, all dogs everywhere, are supremely important to me as they are such beautiful, loving, loyal, cognitive beings,” says Neal Hamil, one of the founders of LegitiMutt.